Ah, snow! We will end the first week of December with a fine, dusty coating of white on the ground. A week ago the temperatures were still in the 30’s and 40’s, but a week later the morning temperatures are in the teens. It seems that missed transitions are a theme this fall, as again we go from relatively warm temperatures to contrastingly cold ones with few days of in-between weather. The forecast for this weekend and next week predicts high temperatures approaching the low 30’s and lows in the single digits on a couple days, although we should be seeing more sun. The arboretum landscape looks like it should at this time of year; the few patches of exposed grass not covered in snow today have finally turned from a vibrant green to a dull yellow, and only the oaks have leaves remaining on their branches. 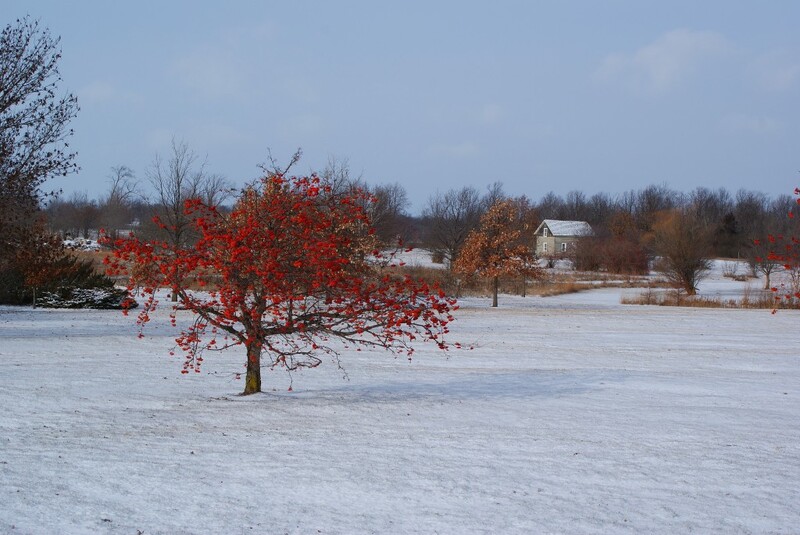 Near the Interpretive Center, the red berries of highbush cranberry, crabapples, and European mountain-ash still provide some bright color against the muted landscape. Early December snowcover in the Arb, 12/4/09.